IMPORTANT: Since 4.17 the Blueprint Compilation Manager broke the custom compiler by not using the interface meant for compilers even when they are available. YOU HAVE TO DISABLE "Blueprint Compilation Manager" on each project that uses PaperZD (4.17 and 4.18). 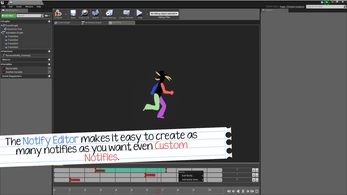 ZetaD is response to Paper2D lack of animation support, allowing users to create their own AnimBP just as on 3D and be able to use them to drive the animation states or events in a easy and visual way. 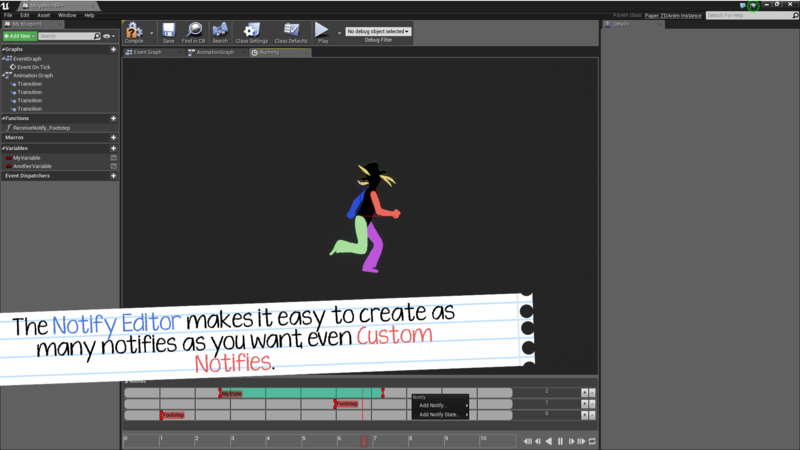 - PaperZDCharacter: A character that inherits from Paper2D and automatically manages the animation instance and notifies. - PaperZDAnimInstance: The class that is constructed via the AnimBP and will be used by the character to drive the animation and notifies. 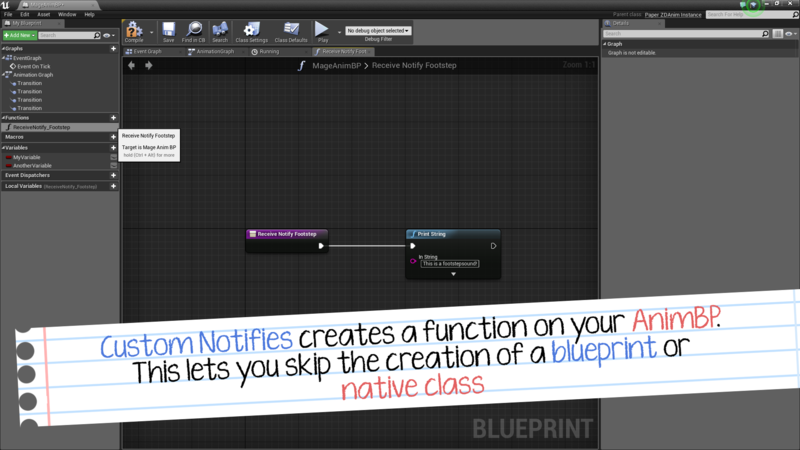 -Can be derived via Blueprint. 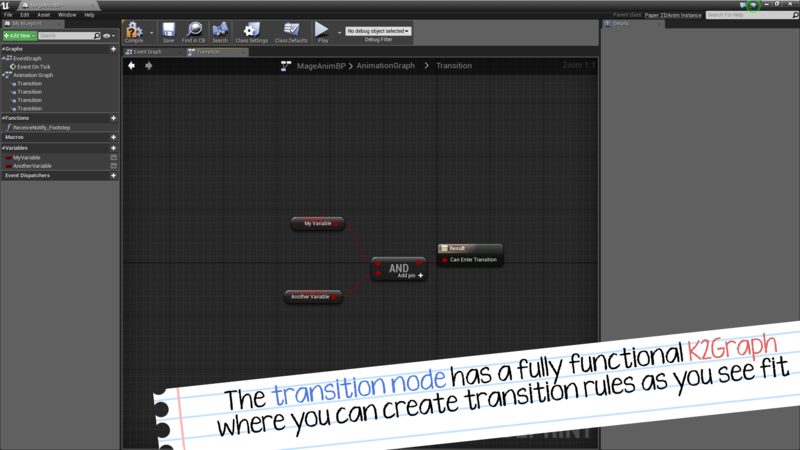 -Can be derived natively, creating native notifies. -Allow the user to create "CustomNotifies" that are implemented by the PaperZDAnimBP, creating a special function that the user can complete. 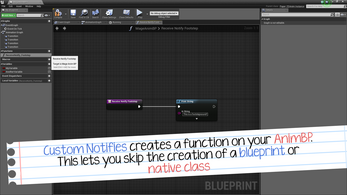 This way the user can avoid having to create a new Blueprint or NativeNotify for functionalities that will not be replicated on other blueprints. -Includes basic notifies (play sound, etc). 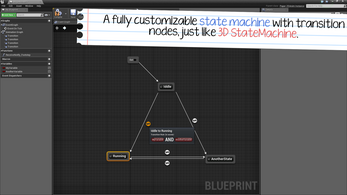 The plugin comes with their own blueprint compiler that constructs the final state machine, blueprint functions and calls. Can you create a Trello Board of planned features / features currently in development? Love the plugin!!!! Also.. we have a discord, if you ever whish to join us! This is an absolutely amazing product for anyone making a 2D project in the Unreal Engine. Communication with the dev is fast, The tools are so easy to use especially if you've already used the 3D tools that come built in to the default engine. 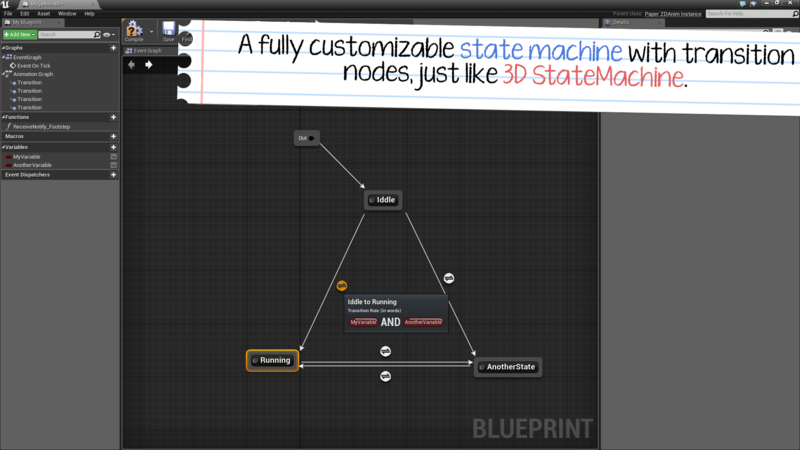 This makes up for lack of 2D support for an AnimNotify system and a StateMachine Editor. They added Sequencer support for anyone who needs easy cutscene/cinematic tools! Thanks a lot! We love what we do, and we want to see more 2d games on unreal too!